For Prelims: Key features of the Act. For Mains: Need for amendments. Context: After taking into account of the recent technological advancement in the field of communications such as social media platforms, etc, the Ministry of Women and Child Development has decided to move fresh Bill to broaden the scope of the Indecent Representation of the Women (Prohibition) Act, 1986 to cover the audio-visual media and content in electronic form. Amendment in definition of term advertisement to include digital form or electronic form or hoardings, or through SMS, MMS etc. Amendment in definition of distribution to include publication, license or uploading using computer resource, or communication device or in. 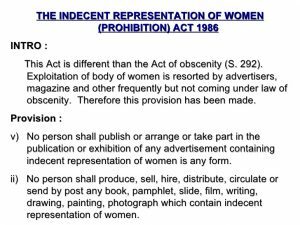 Amendment in section 4 to include that No person shall publish or distribute or cause to be published or cause to be distributed by any means any material which contains indecent representation of women in any form. Functions: This Centralised Authority will be authorized to receive complaints or grievances regarding any programme or advertisement broadcasted or publication and investigate/ examine all matters relating to the indecent representation of women. 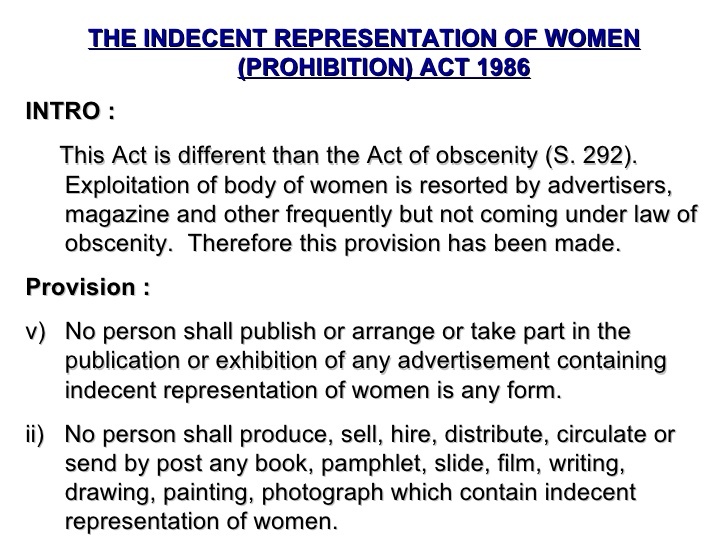 The Government of India has enacted the Indecent Representation of Women (Prohibition) Act (IRWA), 1986 to prohibit indecent representation of women through advertisements, publications, writings, paintings, figures or in any other manner. Since the enactment of the Act, technological revolution has resulted in the development of new forms of communication, such as internet, multi-media messaging, cable television, over-the-top (OTT) services and applications e.g. Skype, Viber, WhatsApp, Chat On, Snapchat, Instagram etc. Therefore, these technological advancements make it necessary to widen the scope of the law so as to cover such forms of media on one hand and to strengthen the existing safeguards to prevent indecent representation of women through any media form on the other. For Prelims: What is Proxy voting? Highlights of the Bill. For Mains: Significance of the Bill. Context: Lok Sabha has passed Representation of the People (Amendment) Bill, 2017 to extend the facility of ‘proxy voting’ to overseas Indians, on the lines of service voters. The Bill proposes to allow non-resident Indians (NRIs) to emerge as a decisive force in the country’s electoral politics on their own terms. The amendment paves the way to remove an “unreasonable restriction” posed by Section 20A of the Representation of the People Act, which requires overseas electors to be physically present in their electoral constituencies to cast their votes. Section 20A of the Act provides for registration and inclusion of overseas electors in the electoral rolls. The Registration of Electors Rules, 1960 provide for overseas electors to register themselves in the electoral rolls of their respective constituencies on the basis of self-attested copies of their passport and valid visa, and exercise their franchise in person on production of the original passport at the time of voting at the specified polling booth. Thus, the rules demand for the physical presence of overseas electors in their respective polling stations in India on the day of polling. This causes hardship to the overseas electors. This amendment proposes facilitating an external mode of voting, that is, voting by proxy, whereby such electors can exercise their franchise from their places of residence abroad. If the Bill is passed, overseas voters can appoint a proxy to cast their votes on their behalf, subject to certain conditions to be laid down in the Conduct of Election Rules, 1961. This would considerably mitigate the difficulties presently faced by overseas electors in exercising their franchise. According to the provisions of ‘Representation of the People Act (Amendment) Bill, 2017 overseas Indians, who are entitled to vote in India, can appoint a proxy voter to cast their votes on their behalf. Also, the overseas Indians would be allowed to use the option of proxy, which till now was only available to service personnel. It threatens the very core of democracy as the special treatment violets the fact that there are many times more domestic migrants who also seek to have a voting right at their homes. The proxy voter may cast vote for the candidate who is not desired by oversea Indians. There can be no guarantee of NRI voters exercising their vote in a free and fair manner as there can be no check on coercion or inducement by the employers. There is no guarantee that votes would not be sold to the so called proxy. There is no fixed number of votes a proxy could cast in an election. For Prelims and Mains: PARIVESH- key features and significance. What is it? It is an environmental single window hub for Environment, Forest, Wildlife and CRZ clearances launched recently. This Single-Window Integrated Environmental Management System has been developed in pursuance of the spirit of ‘Digital India’ initiated by the Prime Minister and capturing the essence of Minimum Government and Maximum Governance. PARIVESH: Pro-Active and Responsive facilitation by Interactive, Virtuous and Environmental Single-window Hub. “PARIVESH” is a workflow based application, based on the concept of web architecture. It has been rolled out for online submission, monitoring and management of proposals submitted by Project Proponents to the Ministry of Environment, Forest and Climate Change (MOEFCC), as well as to the State Level Environmental Impact Assessment Authorities (SEIAA). It seeks to give various types of clearances (e.g. Environment, Forest, Wildlife and Coastal Regulation Zone Clearances) from Central, State and district-level authorities. The system has been designed, developed and hosted by the Ministry of Environment, Forest and Climate Change, with technical support from National Informatics Centre, (NIC). It provides single registration and single sign-in for all types of clearances (i.e. Environment, Forest, Wildlife and CRZ), unique-ID for all types of clearances required for a particular project and a single Window interface for the proponent to submit applications for getting all types of clearances (i.e. Environment, Forests, Wildlife and CRZ clearances). PARIVESH offers a framework to generate economic growth and strengthens Sustainable Development through e- Governance. With automatic highlighting of non-compliance by the system, PARIVESH helps in improving the overall performance and efficiency of the whole appraisal process. It also helps the processing authorities, as it has a Single Window System for Central, State and District level clearances. The facility of Geographic Information System (GIS) interface for the Appraisal Committee will help them in analyzing the proposal efficiently, automatic alerts (via SMS and emails) at important stages to the concerned officers, committee members and higher authorities to check the delays, if any. It also enables project proponents, citizens to view, track and interact with scrutiny officers, generates online clearance letters, online mailers and alerts to state functionaries in case of delays beyond stipulated time for processing of applications. For Prelims: Features of ZBNF. 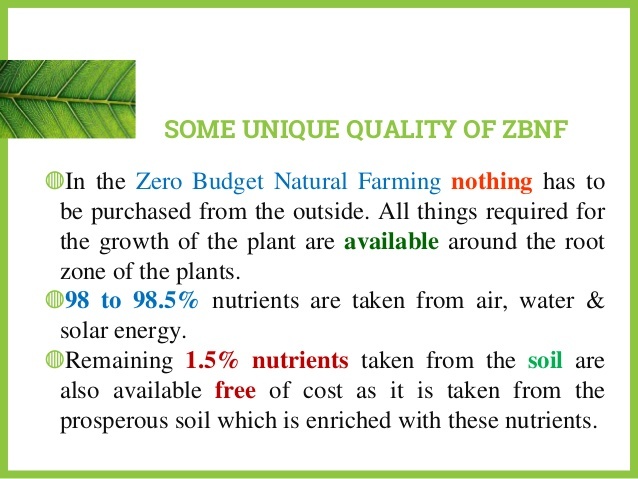 For Mains: Significance of ZBNF, advantages of ZBNF. Context: Indian Council of Agricultural Research (ICAR) under Network Project on Organic Farming (NPOF) and All India Coordinated Research Projects (AICRP) on Integrated Farming Systems, has initiated an experiment on “Evaluation of zero budget farming practices in basmati rice-wheat system” at Modipuram (Uttar Pradesh), Ludhiana (Punjab), Pantnagar (Uttarakhand) and Kurukshetra (Haryana) from rabi 2017 to study the zero budget farming practices on productivity, economics and soil health including soil organic carbon and soil fertility. Government of India has been promoting organic farming in the country through the dedicated schemes of Paramparagat Krishi Vikas Yojana (PKVY) since 2015-16 and also through Rashtriya Krishi Vikas Yojana (RKVY). In the revised guidelines of PKVY scheme during the year 2018, various organic farming models like Natural Farming, Rishi Farming, Vedic Farming, Cow Farming, Homa Farming, Zero Budget Natural Farming (ZBNF) etc. 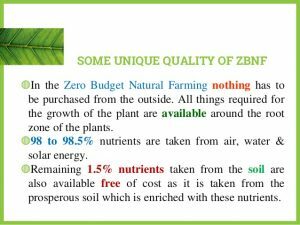 have been included wherein flexibility is given to states to adopt any model of Organic Farming including ZBNF depending on farmer’s choice. Under the RKVY scheme, organic farming/ natural farming project components are considered by the respective State Level Sanctioning Committee (SLSC) according to their priority/ choice. For Prelims: Particulars of Silk Worms, Central Silk Board. 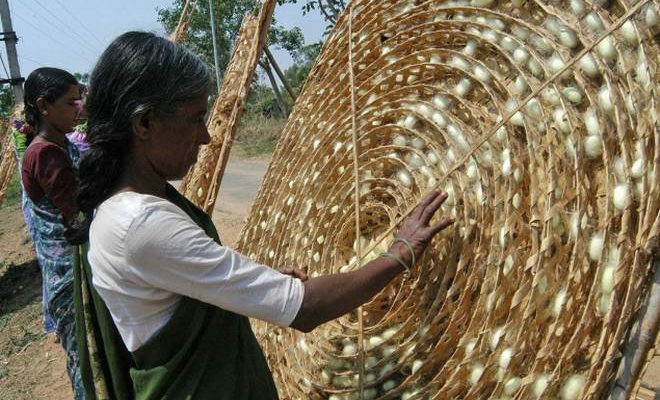 For Mains: Significance of Sericulture. Context: Central Silk Board (CSB) has notified recently developed races of silkworm seed of mulberry and Vanya silk for increasing the productivity of cocoons and to increase the income of the farmers engaged in sericulture. Tropical Tasar Silkworm (BDR-10) race developed by the CSB have 21% more productivity than the traditional Daba breed. Farmers can get upto 52 kg cocoons per 100 disease free layings (dfls). 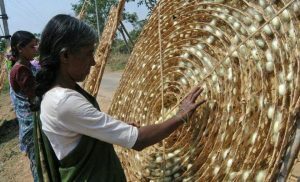 Thissilkworm breed will help the tribal farmers of Jharkhand, Chattishgarh, Odisha, West Bengal, Andhra Pradesh, Maharastra, Madhya Pradesh, Bihar, Telangana and Uttar Pradesh. Multivoltine x Bivoltine Mulberry hybrid (PM x FC2) race of silkworm can produce 60 kg per 100 Dfls and the race is better than earlier race PM x CSR. Due to high quality silk and significant egg recovery, this race is suitable for the farmers of Karnataka, Andhra Pradesh, Tamil Nadu, Telangana and Maharastra. Eri Silkworm (C2) race has been found better than local breed and it can produce 247 numbers of Eri cocoons per 100 Dfls. This race is suitable for the farmers in Arunachal Pradesh, Assam, Bihar, Maharastra, Madhya Pradesh, Manipur, Meghalaya, Mizoram, Nagaland, Odisha, Sikkim, Uttar Pradesh, Uttarakhand and West Bengal. Silk worm breeds for specific agro-climatic condition are essential for increasing the productivity of cocoons. The recently notified silkworm races will improve the income of the farmers by its enhanced productivity and quality. Central Silk Board (CSB) is a Statutory body established in 1948 by an Act of Parliament. It is working under the administrative control of Ministry of Textiles, Government of India. For Prelims: PMGSY- key features. 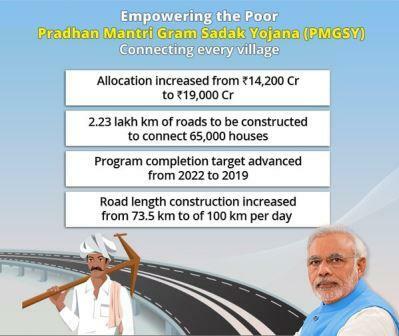 For Mains: Significance of PMGSY and significance of rural road connectivity. Context: Cabinet Committee on Economic Affairs (CCEA) has approved continuation of Pradhan Mantri Gram Sadak Yojana (PMGSY) beyond 12th Five Year Plan period ((2012–2017)). It will help in connecting 38,412 habitations at estimated cost of Rs. 84,934 crore. The centre’s share will be Rs 54,900 crore and states’ share is Rs 30,034 crore. Initially the targets of PMGSY were to be achieved by March 2022, however, the sunset date of achievement of PMGSY-I was pre-poned to March, 2019, with enhanced fund allocation and changed funding pattern i.e. in the ratio of 60:40 between the Centre and State for all States except for 8 North Eastern and 3 Himalayan States (Jammu & Kashmir, Himachal Pradesh & Uttarakhand) for which it is 90:10. Under, PMGSY-II, against the target length of 50,000 km works of upgradation almost 32,100 km road length have been sanctioned in 13 States, which have transited to PMGSY-II. Against the sanctions issued, 12,000 km road length has been completed up to March, 2018. The Task of connecting 1,78,184 eligible unconnected habitations under PMGSY on its way towards completion by March, 2019. So far, 95 per cent habitations (1,69,415) have been sanctioned, of which 91 per cent habitations (1,54,257) have been connected including 16,380 habitations connected by the States from their own resources. Against the sanctioned length of 6,58,143 km, 5,50,601 km road length has been completed. The scheme, launched in 2000, aims to provide single all-weather road connectivity to all eligible unconnected habitations in rural areas with population of 500 persons and above (in plain areas) and 250 persons and above (in hilly states, desert areas, tribal areas and selected tribal and backward districts). Union Ministry of Rural Development is nodal ministry for implementation of Scheme. The government has launched a web portal called ‘PENCIL’ for effective implementation of the National Child Labour Project, (NCLP). PENCIL (Platform for Effective Enforcement for No Child Labour) — an electronic platform for no child labour in the country has been developed by the Labour Ministry. Context: Transport Ministry Notifies Colour for Registration Mark of Battery Operated Vehicles. The Ministry of Road Transport and Highways has notified amendments to Central Motor Vehicles Rules, 1989 to this effect. As per the rules, all Battery Operated Vehicles shall now exhibit their registration mark in Yellow colour on Green background for transport vehicles and for all other cases, in White colour on Green background. What is it? 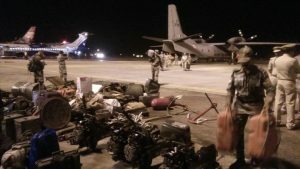 Operation “Madad” has been launched by the Southern Naval Command (SNC) at Kochi since 09 Aug 2018 for assisting the state administration and undertaking disaster relief operations due to the unprecedented flooding experienced in many parts of Kerala, owing to incessant rainfall and release of excess water from Idukki and other dams.